OUTSIDE, America’s leading active lifestyle brand, has selected Ocean Doctor as an honoree of its annual Best of Travel awards. From newly-revealed travel territories to the best deals, OUTSIDE’s Best of Travel 2015 celebrates the destinations and travel providers that inspire people to participate in an active lifestyle. Ocean Doctor’s Cuba Travel Program, which includes scuba diving trips to Cuba’s Gardens of the Queen National Park, was honored as “Best Dive.” The entire list of winners appears in OUTSIDE’s April issue (on newsstands March 18, 2015), and online at www.outsideonline.com/bestoftravel. This year, OUTSIDE’s adventure travel veterans scoured the globe to identify the coolest mountains to climb, food to eat, rivers to float, guides to hire, beaches to lounge on, and lodges to luxuriate in. The result is 40 breathtaking options—from the guides to show you around, to the cameras to capture it all, to the places to stay, to the best place to grab a snack at a food truck along the way. Travel to Cuba under this program is legal for U.S. citizens and residents. Under the U.S. economic embargo of Cuba, travel to Cuba by U.S. citizens for tourism is prohibited. However, licensed “people-to-people” educational visits are permitted. Ocean Doctor’s Cuba Travel Program examines the relationship of Cuban citizens with their natural environment, including burgeoning socioeconomic and cultural issues brought about by Cuba’s growing ecotourism industry. The exchange also represents an opportunity to explore important environmental issues that impact the marine waters that both nations share through face-to-face interaction. The environment, and particularly the marine environment, is something that both biologically and culturally joins Cuba and the U.S. and the exchanges build upon the strong relationships Ocean Doctor has forged through since 2000 through its scientific research programs in Cuba. Visitors meet with Cuban scientists, resource managers, ecotourism professionals and community members. Six days of this 11-day/10-night trip will be spent aboard a floating hotel or liveaboard dive vessel in the heart of Cuba’s Gardens of the Queen (Jardines de la Reina) National Park, located 60 Miles off the southern coast of Cuba, an archipelago comprising a chain of 250 virgin coral and mangrove islands extending along 75 miles of turquoise waters. Gardens of the Queen was recently featured on an award-winning segment of the CBS news program, 60 MINUTES hosted by Anderson Cooper. Gardens of the Queen is Cuba’s first marine park and the largest no-take marine reserve in the Caribbean, where much of the story lies underwater. U.S. visitors will accompany Cuban specialists and be able to scuba dive in one of the healthiest marine ecosystems remaining in the Caribbean. Space is limited. Visitation to Cuba’s Gardens of the Queen is limited to only 1,000 divers per year by the Cuban government. The complete list of Best of Travel winners will be featured in the April issue of OUTSIDE, available March 17, and online at www.outsideonline.com/bestoftravel.Continue the conversation with #OutsideTravel2015. About Ocean Doctor: Ocean Doctor, a project of The Baum Foundation, is a nonprofit organization founded in 2004 by Dr. David E. Guggenheim, dedicated to protecting and restoring our oceans through hands-on conservation. Ocean Doctor’s major projects include Cuba Conservancy, a comprehensive program of international collaboration for research and conservation in Cuba, and Ocean Doctor’s “50 Years – 50 States – 50 Speeches” Expedition, a journey to schools in all 50 States to deliver inspirational education programs to students about the oceans while encouraging careers in science. About OUTSIDE: OUTSIDE is America’s leading active lifestyle brand. Since 1977, OUTSIDE has covered travel, sports, adventure, health, and fitness, as well as the personalities, the environment, and the style and culture of the world Outside. 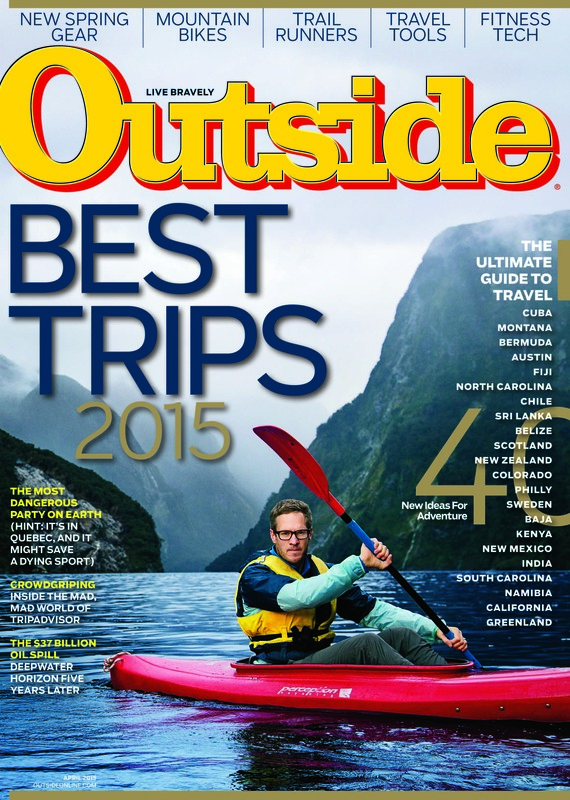 The OUTSIDE family includes OUTSIDE magazine, the only magazine to win three consecutive National Magazine Awards for General Excellence, The Outside Buyer’s Guides, Outside Online, Outside Television, Outside Events, Outside+ tablet edition, Outside Books, and now Outside GO, a revolutionary, 21st-century adventure-travel company. Visit OUTSIDE online, on Facebook and Twitter.